This weekend, we caravanned to Seattle along with my parents and my brother-in-law and a few of his kids to empty out our storage unit. We didn’t bring a lot with us when we moved, just what we could carry in my hatchback and Drew’s little pick-up. Since we’re staying with my parents while getting the building site prepped, we didn’t want to bring too much. Living out of suitcases for a month got old fast though. More than once, I ended up buying something I already owned in storage across the state — hair products, for example, since the sample sizes I brought with me ran out after a few weeks, and some essential (to me) pantry staples that Mom doesn’t keep on hand. Now we have the red steamer trunk that holds all of our clothes (Drew and I both do capsule wardrobes so we can comfortably share one clothing chest), and my box of shoes (the sandals I brought with me aren’t exactly ideal for clearing brush or digging holes). Somewhere in Mom’s garden shed, piled up with the rest of our boxes, is the one labeled HABA that holds essentials like extra contact lenses and new razor blades. Searching for it later will be a pain, but still faster and cheaper than driving 15 minutes to the grocery store. Aside from a few beloved furniture pieces stored in my in-laws’ basement, our stuff is condensed down to a pile of boxes. I’m not sure whether to be impressed that most of our worldly possessions fit in Mom’s little garden shed, or dismayed that we still have so many boxes, despite our best efforts to winnow down our stuff. In one of those magical bits of synchronicity the universe likes to scatter in our path like breadcrumbs, the process of sorting and eliminating excess stuff began about a month before Drew lost his job and we decided to move. 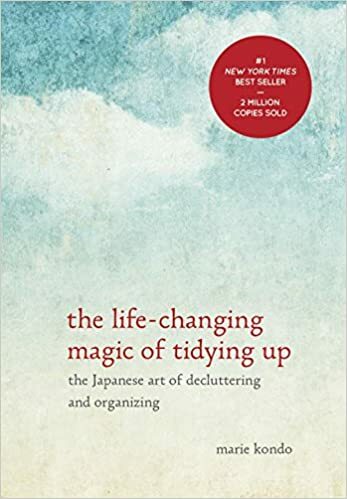 I’d borrowed The Life-Changing Magic of Tidying Up from the library, and came away feeling like I’d discovered a new religion. I remember waxing to my co-workers about the concept of keeping only those possessions that kindled a spark of joy, and thanking and releasing the rest. Drew and I had already gotten rid of about half our clothing by the time we decided to move. Afterwards, we culled about 3/4 of our massive book collection, and cleared out kitchen drawers and cupboards. Most of our stuff went to the Goodwill donation bins, and for once, we opted to take their tax receipts. We conservatively estimate we donated about $500 worth of stuff this spring, which we can write off on our taxes this year. If we’d had more time, we might have sold some of it and helped finance the move, but we were on a tight schedule. What I liked most about the kon-mari method is that now I do genuinely love most of my possessions now. It made me smile to look at my bookshelf and see only titles I love and plan to read again. As always, we still have work ahead of us. There are some things neither of us feels any particular attachment to, but that we kept out of necessity — lamps, cooking pots, that kind of thing. For now, I reason that we do love reading in bed and cooking, so it’s worth keeping them around. Randomly, the only things I wish I hadn’t donated are some of my old, beat up clothes. Too late, I realized that with the kind of hard labor ahead of us, I need to have work clothes that I don’t mind destroying. That hit me in time to salvage a pair of lackluster jeans and a couple of t-shirts from the donation bin, but when the weather eventually turns cold again, I will probably need to buy a second-hand flannel to replace the ones I donated. I’m sure that once we have our little house finished and our possessions unpacked, we’ll need to go through the kon-mari method again, eliminating things that no longer fit our new lifestyle in the country. With all of my stuff in boxes, though, that’s a step I’m looking forward to. I should really read that book! Here’s hoping our library system has it.